Oh, gluten. You have earned too much negative attention that you don’t deserve. I read nonsense things about you on the internet, and overhear strangers in the grocery line talking about cutting you out for “health” or worse-weight loss. Why you, gluten? We have been eating you for years and years. Now, you are suddenly the headlines of news- the magical reason why Americans are so “unhealthy”. Yet another food people are fear mongered to restrict, leading to dieting and disordered eating. Let’s talk about what gluten actually is, and what it is not. 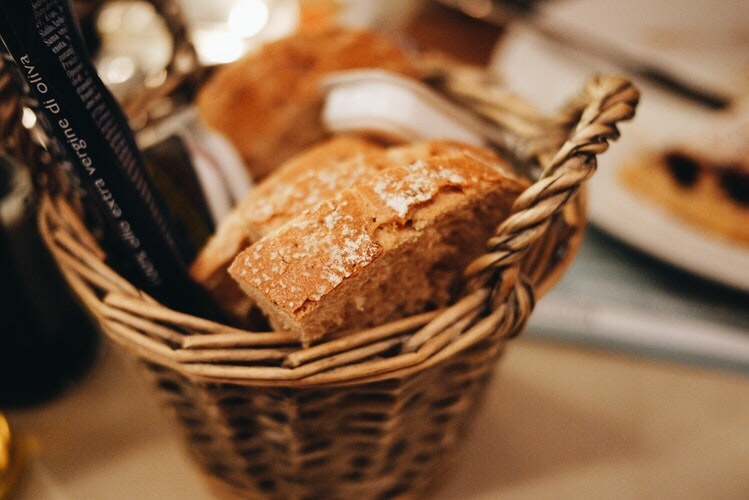 Gluten is a protein found naturally in wheat, rye, and barley. It gives breads and dough elasticity and strength to support its structure, and is important for making bread rise. Gluten is likely NOT the reason why you feel tired, or why you have bloating, or why your body size has changed (see Set Point Theory blog post for more info on body size). The media is laden with claims of gluten causing “brain fog”, “inflammation” and “poor gut health” but truth is, our bodies digest gluten just fine. Sifting through the research, there is no evidence that shows removing gluten out of your diet is beneficial. Unless, of course, you have Celiac disease. Celiac disease is an immune reaction when gluten damages the lining of your gut. You can think of this as a gluten allergy. This leads to malabsorption, bloating, gas, fatigue, diarrhea, etc. Celiac disease only affects 1% of the population. This is diagnosable by a blood test done with your doctor before cutting out gluten. If a person has undiagnosed Celiac disease and removes gluten before getting the test done, the test may read a false negative. Most people who are “gluten free” do not have Celiac disease, rather have something else going on with food. There are many different reasons why you may feel discomfort in your stomach and GI tract that have nothing to do with gluten. To start, going too long between meals can cause uncomfortable GI symptoms. Have you ever gotten past the point of hunger where the hunger goes away but your stomach feels painful? When we go too long without food in our stomach, excess stomach acid can cause gas and discomfort. This is why eating every 3-4 hours (or at least checking in with yourself) is key. Another reason you may be experiencing GI symptoms could be IBS, or irritable bowel syndrome. This is a diagnosis given by doctors when GI symptoms are experienced (excess gas, bloating, diarrhea, constipation, etc) but the cause is uncertain. Key point here- diagnosed by doctor. There are many different scenarios that could be occurring that are directly related to the GI (other GI diseases, shape and size of your intestines, genetics) that can cause symptoms, BUT ITS STILL NOT GLUTEN! I know what you’re thinking-Hannah, why do you care so much about people cutting out gluten? Cutting out gluten is a diet in disguise and we all know diets don't work. Dieting is harmful and leads to feeling of guilt, shame and disordered thoughts around food. Which leads me to another point: Having negative thoughts or anxiety around certain foods can also cause bloating, nausea, diarrhea and other symptoms that can mimic an “intolerance”. Our gut is directly connected to ourbrain, and feelings around food can upset our digestion. For example, if you tell yourself you can’t have cookies or pasta because they contain gluten, then proceed to eat them in a shameful mindset, these GI symptoms can be experienced. It has nothing to do with gluten, rather the feelings you experienced while eating. Also, cutting out foods that contain gluten (mostly grains) will also cut out B vitamins and fiber-nutrients that promote a healthful brain and gut. If the reasons above don’t resonate with you, but you’re a nerd like me and are into science based research, the evidence just isn’t there for gluten. The GI system is very complex. There can be a multitude of reasons why you are experiencing discomfort that has nothing to do with gluten. If you are having severe symptoms, the best thing to do is go to a GI doctor before you cutting any food out. If you choose to not consume a food because you truly feel better, you are the expert of your body. However, I would ask yourself this question- Is the reason I am limiting this food because I truly feel better without it, or am I subconsciously going on a diet with an agenda?